Spectacular new observations of vast pillar-like structures within the Carina Nebula have been made using the MUSE instrument on ESO's Very Large Telescope. The different pillars analysed by an international team seem to be pillars of destruction—in contrast to the name of the iconic Pillars of Creation in the Eagle Nebula, which are of similar nature. The spires and pillars in the new images of the Carina Nebula are vast clouds of dust and gas within a hub of star formation about 7500 light-years away. The pillars in the nebula were observed by a team led by Anna McLeod, a PhD student at ESO, using the MUSE instrument on ESO's Very Large Telescope. The great power of MUSE is that it creates thousands of images of the nebula at the same time, each at a different wavelength of light. This allows astronomers to map out the chemical and physical properties of the material at different points in the nebula. 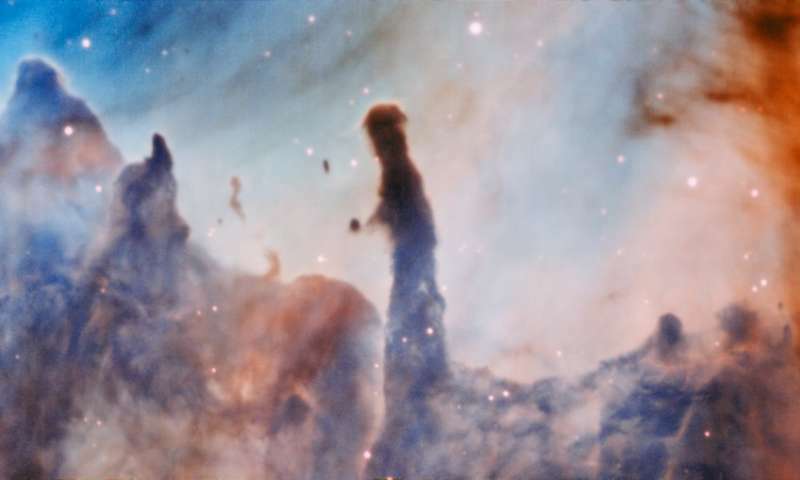 Images of similar structures, the famous Pillars of Creation/ in the Eagle Nebula and formations in NGC 3603, were combined with the ones displayed here. In total ten pillars have been observed, and in so doing a clear link was observed between the radiation emitted by nearby massive stars and the features of the pillars themselves. In an ironic twist, one of the first consequences of the formation of a massive star is that it starts to destroy the cloud from which it was born. The idea that massive stars will have a considerable effect on their surroundings is not new: such stars are known to blast out vast quantities of powerful, ionising radiation—emission with enough energy to strip atoms of their orbiting electrons. However, it is very difficult to obtain observational evidence of the interplay between such stars and their surroundings. The team analysed the effect of this energetic radiation on the pillars: a process known as photoevaporation, when gas is ionised and then disperses away. By observing the results of photoevaporation—which included the loss of mass from the pillars—they were able to deduce the culprits. There was a clear correlation between the amount of ionising radiation being emitted by nearby stars, and the dissipation of the pillars. This might seem like a cosmic calamity, with massive stars turning on their own creators. However the complexities of the feedback mechanisms between the stars and the pillars are poorly understood. These pillars might look dense, but the clouds of dust and gas which make up nebulae are actually very diffuse. It is possible that the radiation and stellar winds from massive stars actually help create denser spots within the pillars, which can then form stars. These breathtaking celestial structures have more to tell us, and MUSE is an ideal instrument to probe them with.